The Rookie Razor cuts clean and close to the skin. And it’s a great induction into better, less wasteful way of shaving. The double-edged blade won’t tug or pull on hair, so you get smooth shave minus the ingrowns and irritation. The buffer between the blade’s edge and your skin gives extra safety, too. The gift set comes with everything you could possibly need to groom, including extra blades, shaving creams, and alum matches (in case you get a nick). Dimensions: 3.5" x 3.5" x 7"
This might be the last razor you ever buy. 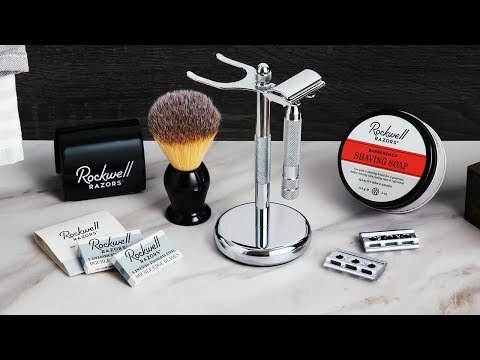 Rockwell’s adjustable safety razor’s Made for a Lifetime design uses stainless steel blades for a clean, close-to-the-skin cut. They pride themselves on great craftsmanship and a clean, close shave. The single, double-edged blade won’t tug or pull on hair, giving you smooth results minus the ingrown hairs and irritation. And, for added safety, they’ve built a buffer between the edge of the blade and your skin. Their more robust razor comes with three adjustable plates (for a total of six size settings), which lets you match it to your skin type and facial hair length. Plus, the plates angle to your face’s contours. If you’re looking for an induction, the Rookie Razor has a single plate and is a great upgrade from disposable razors. The substantial metal body on every Rockwell razor is engineered to last. Instead of tossing out entire razors, you just replace the blades. Not only is that soft on your skin, it’s also wallet- and planet-friendly.